A Gene List Editor allows for the editing of sets of genes. The individual experiment details: he results for the gene within each experiment are shown in separate columns. If null values are stored these are defaulted to zero. Accession id: if there are any annotations available for the gene then this information is shown. If available a hyperlink to an external data source is provided. DB: the name of the databank which the annotation comes from. Description: A text description of the phenotype function is given. By using the Edit->Annotation option it is possible to select a different default annotation databank. If more than one annotations is mapped to the gene then the list of the annotations are shown with a reliability score (if available). The annotation information is retrieved on the fly from the server, this means that there will be a delay as information is retrieved in chunks. Navigation buttons at the bottom of the Genes table allow for paging through the subset of genes. Items that are selected within this table can be saved as separate collections, this is done by using the 'copy selected' item in the Edit menu. 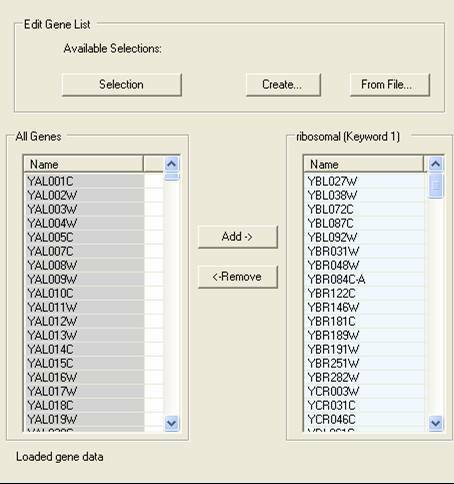 It is possible to edit the individual genes in a selection by using the Gene List Editor option. This allows for the direct addition or removal of genes from a specific group. By using the Selection button at the top of the editor it is possible to choose the selection to be edited. The genes that are in the chosen selection are shown on the right. Genes are added or removed from the selections using the controls at the bottom of the dialog. A new selection can be created by select the Create button, and list of gene identifiers in an external file can used to generate a selection by using the From File... button..